Centre of Creativity Targowa 56 was opened on September 30, 2016. It is another facility created in terms of the project “Warsaw Space of Technology”, whose aim is to integrate various initiatives and activities in the area of Warsaw, which concern support and development of entrepreneurship as well as innovative and R&D potential of Warsaw. The main goal of this undertaking is to revitalize and expand an old tenement house registered in the register of monuments and situated on Targowa 56 St. in Warsaw. One of the primary roles of the Centre will focus on the concentration of entrepreneurial potential of creative startups within the incubator inside the facility itself. 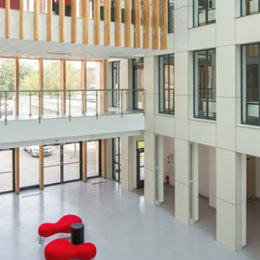 Each floor of the building will hold numerous offices, conference rooms and consultation desks. Entrepreneurs will also have an opportunity to make and sustain business contacts as well as organize informal meetings with customers in business café, which will be situated on the ground floor next to the entrance hall, front office and concept store. Centre of Creativity Targowa 56 will also serve as a technical and institutional backup for all the activities, which contribute towards economic growth of the City of Warsaw throughout support of creative sector. It will particularly focus on aiding creative entrepreneurship and will constitute both cooperation network and experience-sharing platform. The facility will be open to developing any entrepreneurial idea concerning creative sector. An added value of the undertaking will display itself throughout supporting integration of initiatives, projects and various activities, which will also embrace the idea of entrepreneurial-, innovative- and creative growth within the area of capital city.